Is your preferred day fully booked? Please click here for an awesome alternative! 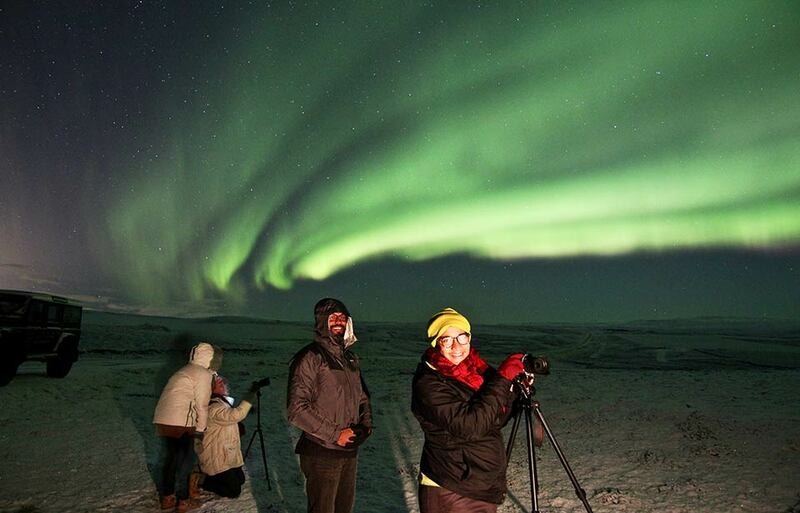 On this Northern Lights and Stargazing tour you are not a tourist, you are an important member of a team of sky explorers. As we introduce you to the dark Arctic night away from city lights the sky will take you on a journey with it’s dancing Northern Lights and other awe-inspiring sky events. We travel in modified Land Rover Defenders – Because the Earth is not Flat. Prepare for an adventurous activity tour rather than luxury! DURATION: 3-5 hours from pick up to drop off. Free pick up from anywhere in central Reykjavík. PRICE PER PERSON: 21.900 ISK per person. Tripod: Make sure your camera has a tripod mount. Warmer pads: Provide external warmth for 5-8 hours. At our chosen spot, while waiting for the lights, we use our powerful stargazing telescope to explore crude details of the planets in our solar system, their moons and deep space phenomena light years away. 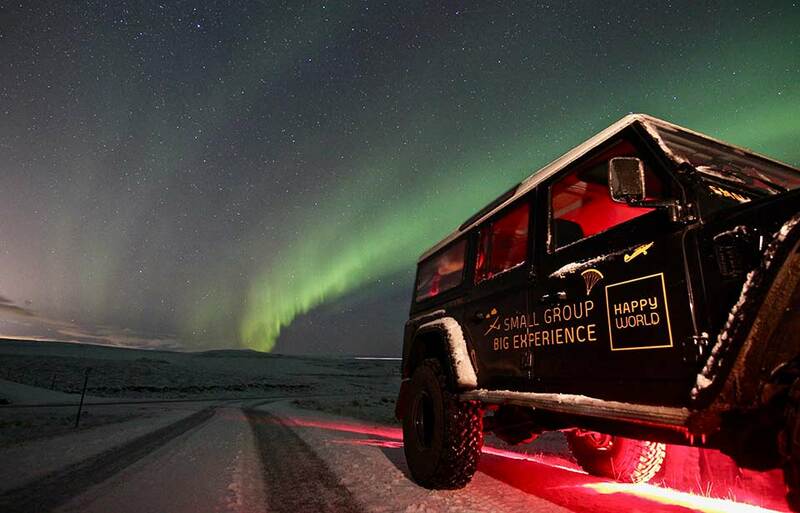 Our mission is to find the perfect Northern Lights Experience for YOU and we don’t give up easily! We stay away from the crowds and we stay small and flexible. We also try to be friendly and fun! Our vehicles are installed with additional diesel heaters to stay warm on location. We take photos of you under the lights, for free, and share them with you the next day. We can also help you set up your own camera. Check out our settings guide here to prepare your camera during daylight hours before the tour. The Northern Lights are a natural phenomenon and displays can never be guaranteed. For a sighting we need three things to come together: solar wind, darkness and a clear sky. Overall, on any given night during dark hours in Iceland, our chances are about 50%. We maximise our sighting chance by going out only when auroral activity and cloud cover forecasts are favourable. Our sighting rate is 90%. We reserve the right to cancel the tour as late as 6.30 pm due to weather not being favourable. We make honest, transparent decisions and e-mail all our guests at 6.30 pm latest to confirm whether the tour is on or off. GO/NO GO: 6.30 pm: Our meteorology expert makes the Go/NoGo decision and e-mails you the decision. Please check your e-mail at 6.30pm with detailed pick up info or re-schedule/refund options. PICK UP TIME: We head out to where conditions are predicted best. LOCATION: At our first stop we assess conditions and decide to stay or keep looking. We stay on location if most likely for sightings. We may change location later on if we believe it to give better results. ON TOUR: While waiting, we explore the sky through telescope, take photos, share stories and explore our location. PHOTOS: When & if the Northern Lights show up our guides take photos of you under the lights and share them with you for free the next day. SNACK: Late evening we serve hot chocolate and Kleina to warm you up and keep you going a bit longer. FINISH: If no lights are seen before midnight we may extend up to 60 minutes if we believe our chances are good. DRIVE HOME: The drive back to Reykjavík is normally 45-60 minutes. We are usually arriving back in Reykjavik around 1 am. Sometimes a bit later and sometimes a bit sooner, depending on sighting conditions. DESTINATION: Our final destination is dictated by weather and where sightings are most likely. Normally withing a 45-60 min. driving radius from Reykjavik. TOUR GROUP SIZE: Min. 2 and max. 7 guests per guide/vehicle. Max 2 vehicles travelling together. CLOTHING: We recommend thick, thermal, windproof winter gear. Click here for our Clothing guide. INCLUDED: Pick-up in central Reykjavik, driver/guided tour, home made hot chocolate & Kleina (local delicacy) and photos. The Northern Lights or their magnitude can never be guaranteed. If we do not see any lights on your tour you are welcome with us again for free, subject to availability, as often as needed within 2 years. Please see Tour specific Terms & Conditions below. You can re-schedule or receive a 100% refund. Please see Tour specific Terms & Conditions below. The Northern Lights are our priority, if we are busy hunting for them we may not have time to use the telescope. Free pick up from your hotel/hostel/Airbnb in central Reykjavik. 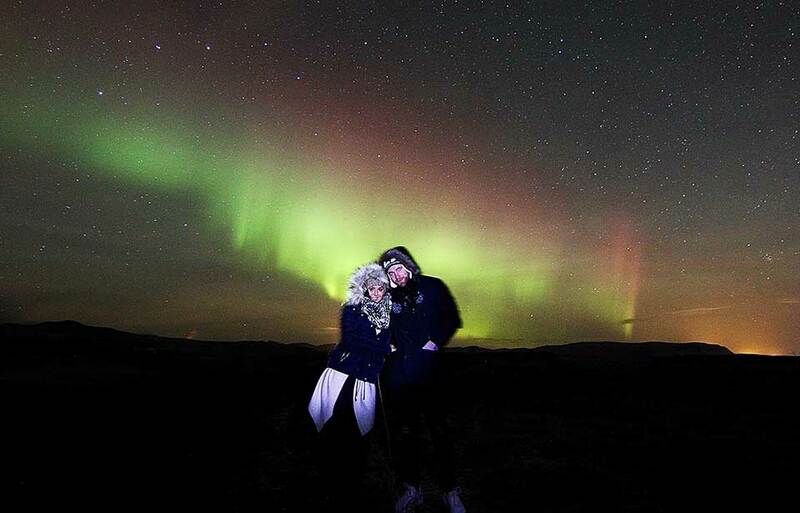 If we don’t have availability on your chosen date please try our non-stargazing but otherwise the same tour: Northern Lights Experience. Or contact us at info@happyworld.is or +354 780 6766.